Posh chairman Darragh MacAnthony is a big fan of Leo Da Silva Lopes. 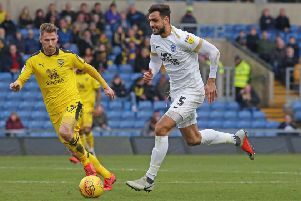 The Posh chairman is frustrated by a perceived lack of support for a teenage midfielder he claims he could have sold in a £4 million deal last year. Dean Moore (left) has left Posh under a cloud. MacAnthony said: “I see in Leo what top football people see. He is unbelievable for his age and I’d love our fans to sing about him the way Spurs fans sing about Harry Kane. “Leo is special. His best position will be as a number 10, but he can play in any midfield position. “I think he plays a bit safe at the moment as he’s scared to make a mistake, but believe me he can go all tyhe way in the game. Craig Mackail-Smith is not expected to be a Posh player next season. “I could have sold Leo in November to a Championship club for £2 million with another £2 million in add ons and a 40% sell on fee. “I don’t know why Posh fans don’t take to their own young players. It was the same with Jermaine Anderson when he was coming through. Other Darragh MacAnthony comments from the exclusive, big interview with the Peterborough Telegraph ..